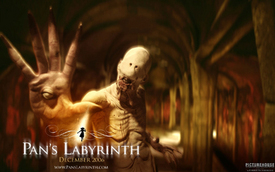 “Pan’s Labyrinth” is a Spanish movie with subtitles. Its creator uses magic realism to tell two simultaneous stories. In one of them, a lost and frightened little girl is confronted with the horrors of Spanish fascism. In the other, she is an adventurous waif tested by supernatural beings and forces. Politically conscious people might be disappointed if they expect a fair assessment and historical account of the civil war. It is one of humankind’s most horrible tragedies. In fact, the historical timeline seems to be bent around a little bit to partially absolve the capitalist superpowers of their international crime. The movie that exposes the truth about the Spanish Civil War and capitalist complicity is not yet made. But “Pan’s Labyrinth” does a formidable job of showing the war’s extreme effect on a small group of people, especially a little girl, at its bloody end. My movie buddy and I loved “Pan’s Labyrinth,” plain and simple. Del Toro uses film techniques, including dramatic special effects, the way they should be used, to tell a story and bring the viewer into it. Techniques aside, whether or not other people will like the movie depends on their willingness to suspend credibility and go along with the filmmaker. Some people won’t be able to stretch their credulity to believe either of the two stories. They should go to another movie or, better still, stay home. Other people may like the war story of the desperate Spanish peasants learning the depths of fascist cruelty. They may be particularly impressed with the icy Captain Vidal, who may have set a new mark for screen villains in the able interpretation of actor Sergi Lopez. The heroic resistance of the common people may inspire some viewers as they confront the extinction of their lives and ideals. But they might not like the other story. The other story is a beautiful and weird fantasy. Fantasy is very close to horror, and it is often difficult to tell which side del Toro prefers as he unwinds the girl’s secret liaisons with fairies, fauns and cannibals. Moviegoers with the wildest imaginations and the lowest threshold of credibility will love the fantasy story and, perhaps, care less for Captain Vidal’s campaign against humanity. The moviegoers who are sure to love “Pan’s Labyrinth” are those who embrace magic realism and fall into both stories with innocent trust that the filmmaker will use to take both stories to successful and intermixed conclusions. Those moviegoers are in for a treat!